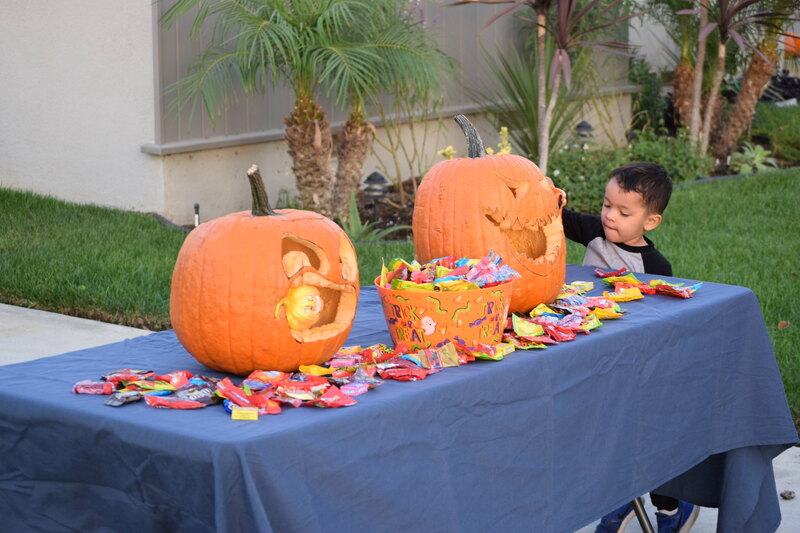 A trend I've noticed for several years is homes that set a table up outside their homes to hand out Halloween candy to the trick-or-treaters. I see the advantages of this setup. Seeing the groups come up to your house. Not having to continuously open and close your door. And in the case of this home, they invited other neighbors to come over and spend the evening. They served dinner and sat around in a circle for good conversation. A great way to make new memories. 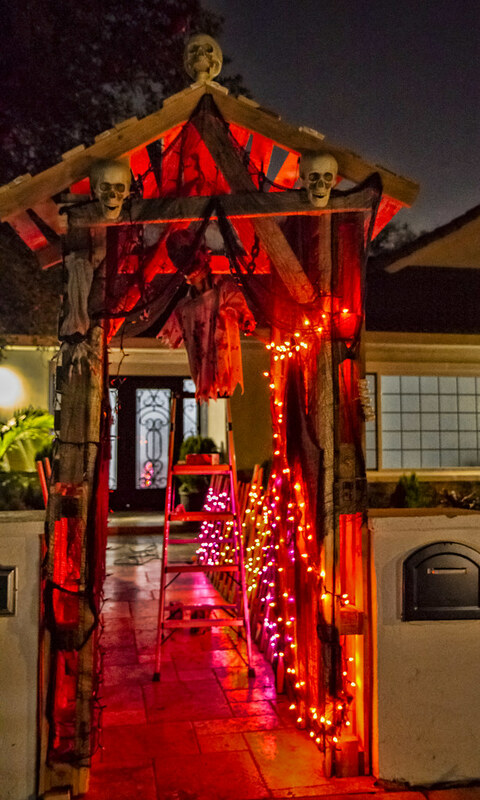 How has your Halloween changed through the years? Now, this is my kind of welcome...broom parking...an acknowledgment that the "Witch is in"...and an invitation to trick or treating! I know where I will be visiting tomorrow night. 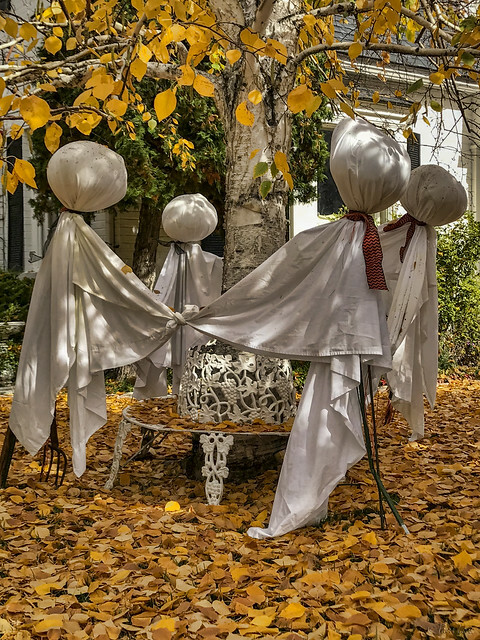 These ghostly figures are celebrating the season around this tree. If it looks like there are more fallen leaves than you'd expect, you're right. I was away this weekend to an area where they actually have fall colors! 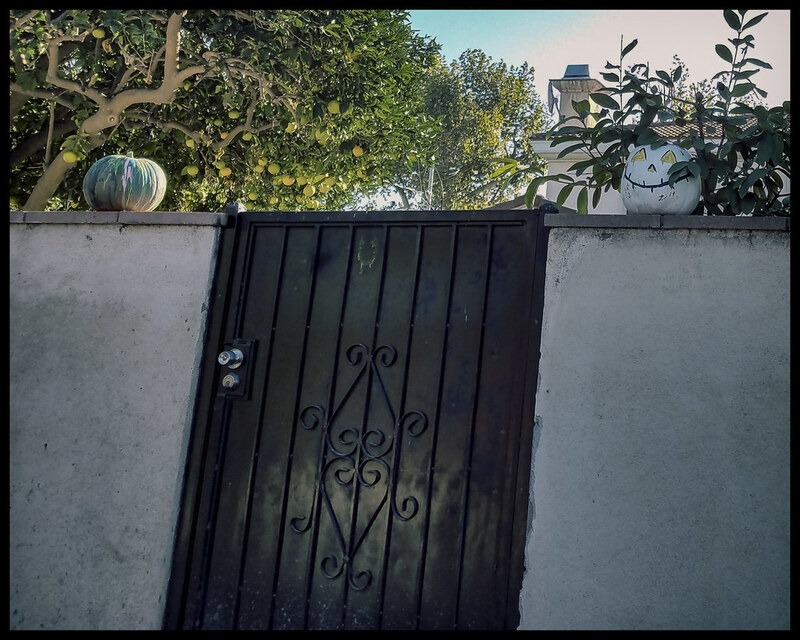 I came across these fun pumpkins sitting on a back wall along an alley. Seeing them somehow reminded me of the children's poem Humpty Dumpty—hopefully these pumpkins will be able to stay on the wall. "Is not this a true autumn day? Just the still melancholy that I love — that makes life and nature harmonise... Delicious autumn! My very soul is wedded to it, and if I were a bird I would fly about the earth seeking the successive autumns." This sight made me laugh, and then made me stop and take the picture. Is it a statement? Or just trash waiting for the large-item pickup truck? Yesterday, I posted about the concert we went to at the Downey Theater on Saturday. 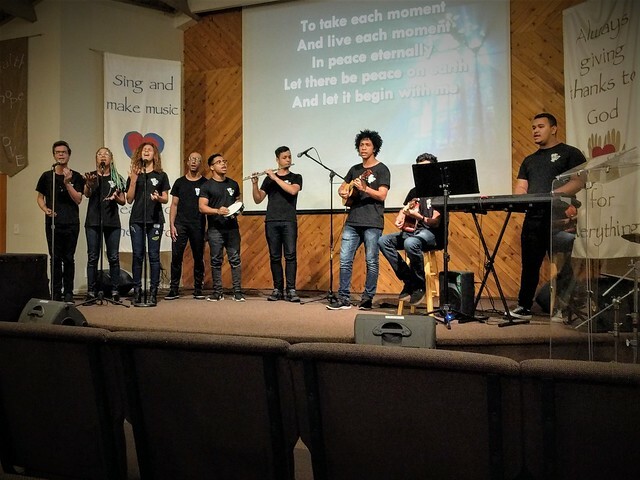 On Sunday, we went to a concert at Redeemer Covenant Church of Downey. It was a group of young performers from Brazil. These young performers were filled with energy and we got to witness them display their talent in several ways. There was dancing, singing, and instrumentals. It was a great experience. The performers are students at Art and Social Transformation in Brazil. This program takes any young artist, especially from low income families or at risk communities and develops their talent to meet their full potential. At the end of summer each year, certain pupils that have shown that they can make a living by using their talents are chosen to participate at Cal Arts Annual 3-week CAPSA program in Los Angeles. You can read about the program here. Afterwards, they travel throughout the United States giving concerts. Redeemer Covenant Church is one of those places that is chosen each year. "Music is the mediator between the spiritual and the sensual life." This last Saturday, we went to the Downey Symphony Orchestra's first concert of the 2018-2019 performance season. It was called ¡Viva la Música! and the night was filled with energy. One part of the performance was the American premiere of Clarinet Concerto No. 3 by Oscar Navarro. The clarinet solo was performed by David Van Maele from Belgium. 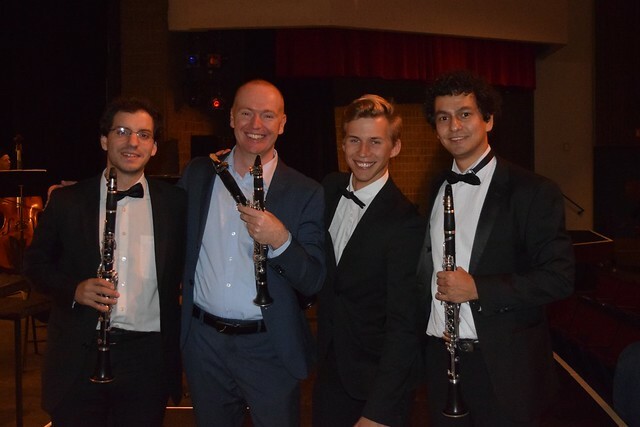 After the concert, the three clarinetists of the orchestra were speaking with Mr. Van Maele on stage and I was privileged to speak with them and take this picture. Mr. Van Maele has a website here. From the program: "David Van Maele commissioned the new clarinet concerto on the program tonight. When David's young son Mattiece tragically passed away, Oscar dedicated the slow movement of the concerto to him. The movement represents a journey to heaven to visit the young boy and give him a last embrace. Oscar's hope is that Mattiece will live forever through the music and its performance." The orchestra's next concert is in January, 2019. You can read about it and get tickets here. See you there. I drive past this center frequently, but somehow have not noticed that it was the office of a psychic. I wonder how busy she stays and how often she is open...it certainly isn't your typical corner business. 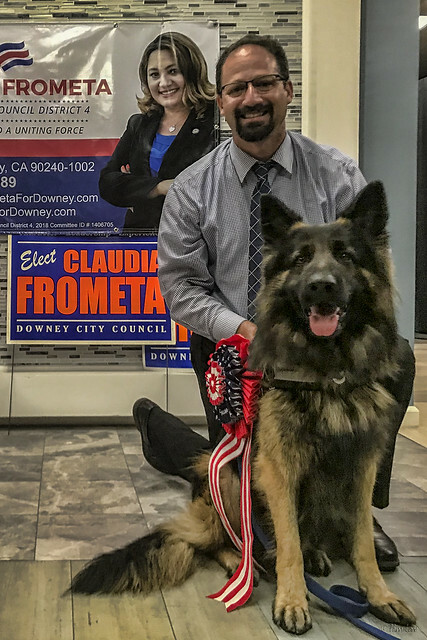 There's a Storm tonight in the Claudia Frometa campaign headquarters in downtown Downey. Storm the German shepherd, that is. He and Claudia's husband Nolveris Frometa were manning the office when I walked by on my evening walk. Storm, with his wagging tail, was very welcoming. 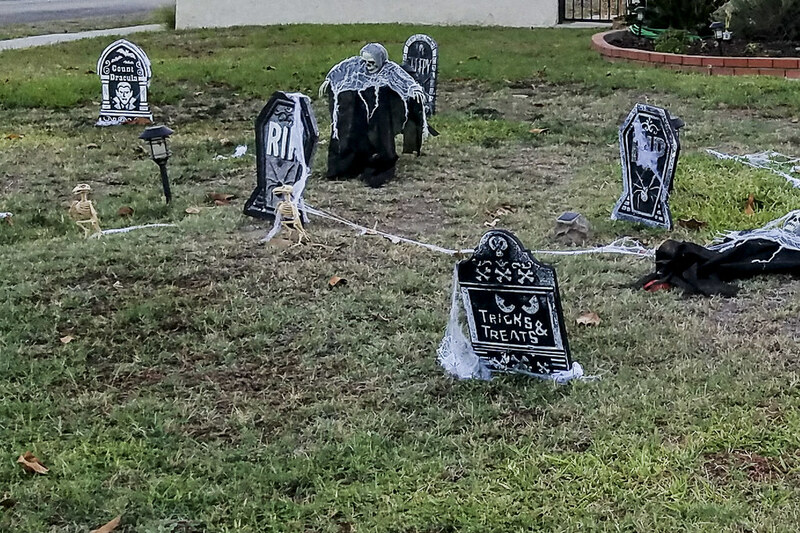 This yard was decorated to the hilt. 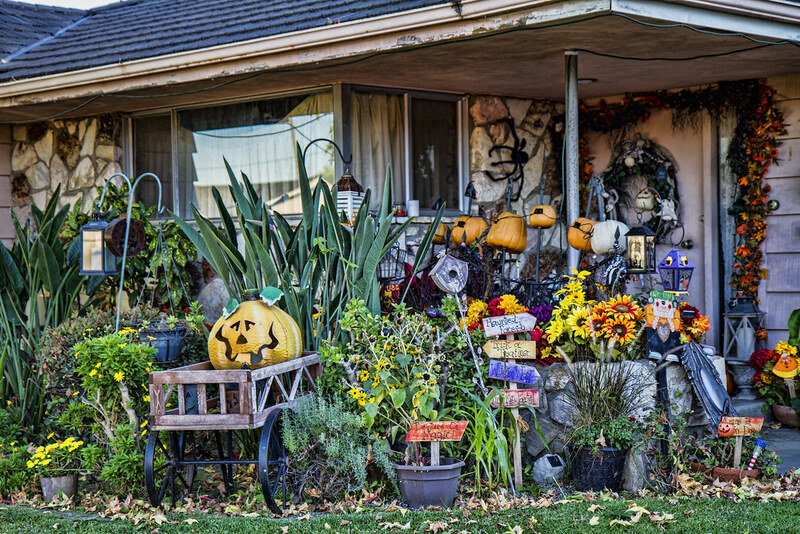 It was such a fun conglomeration of fall color and Halloween decoration. 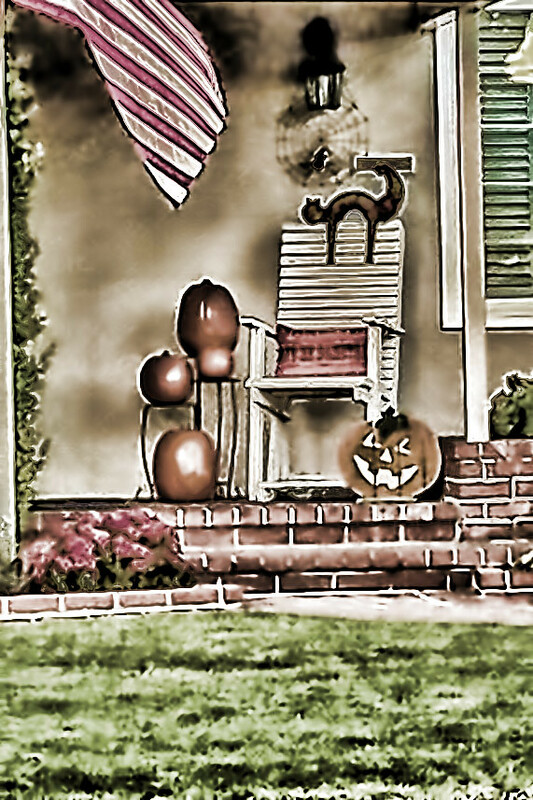 For me, a part of the fun of Halloween is the buildup, seeing yards all over the town dressing up for Halloween and fall. 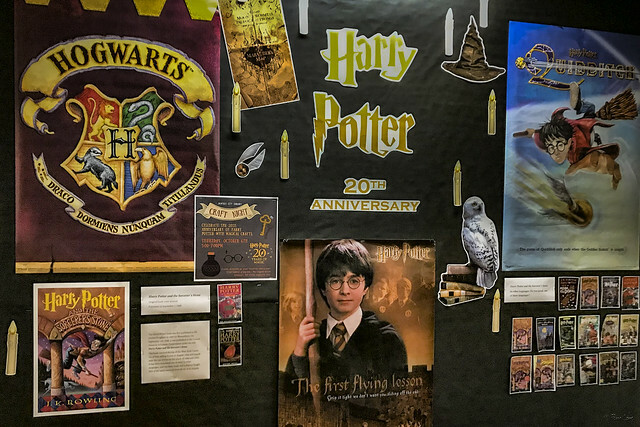 Back at the Downey City Library, there is an exhibit celebrating the 20th anniversary of the first Harry Potter book, Harry Potter and the Sorcerer’s Stone, which arrived in American bookstores on September 1, 1998. Do you remember your first exposure to Harry Potter? I do. I kept reading encouraging reviews, and finally decided to read it myself. I fell in love with Harry, Ron, Hermione, Hedwig, Hogwarts...I could go on and on. I immediately read the book out loud to my daughter. And I joined the millions of kids (young and old) who eagerly awaited each new volume. Each one got longer and longer, but that was OK, because it was just more to enjoy. And then, there were the audio versions, with the absolutely delightful Jim Dale reading the books. Did you know that he once held a Guinness World Record for the number of voices he created for Harry Potter and the Deathly Hallows (147)? He and Harry made my daily commute so much more fun. Sometimes, I was sorry to get home! Books! I love them, and I love that they are freely available for all at the library, for a new generation to fall in love with books new and old. 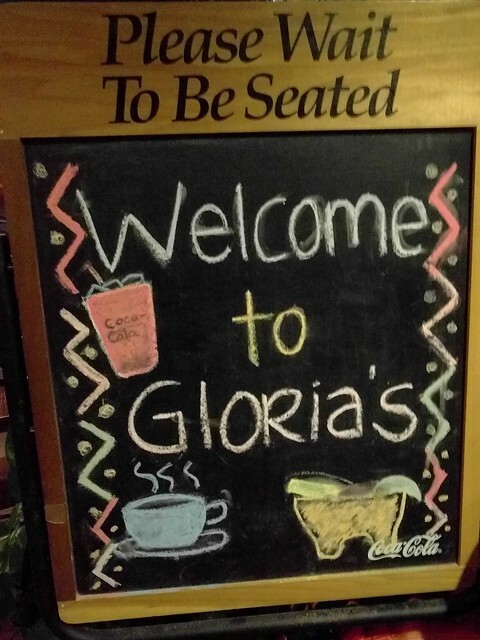 A great part of living in Downey is being able to go to Gloria's Cocina Mexicana restaurant. Tonight, we enjoyed their three-choice combination plate. It included a chili relleno, cheese enchilada, and a taquito, rice and beans. Check out their website here. They are family friendly and serve generous portions. 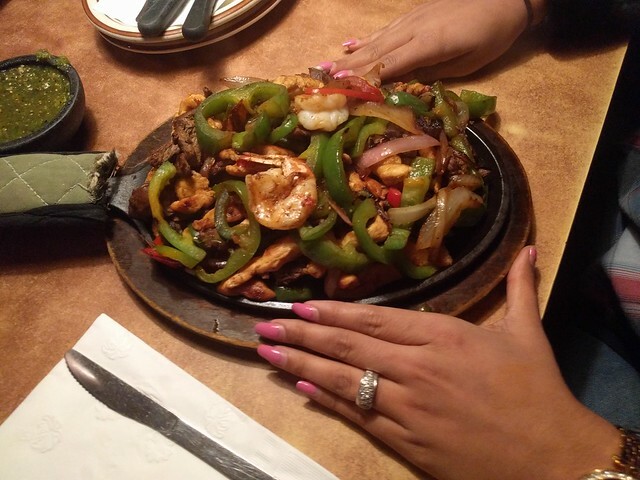 Denise and Ernesto allowed me to show off their freshly prepared fajitas. 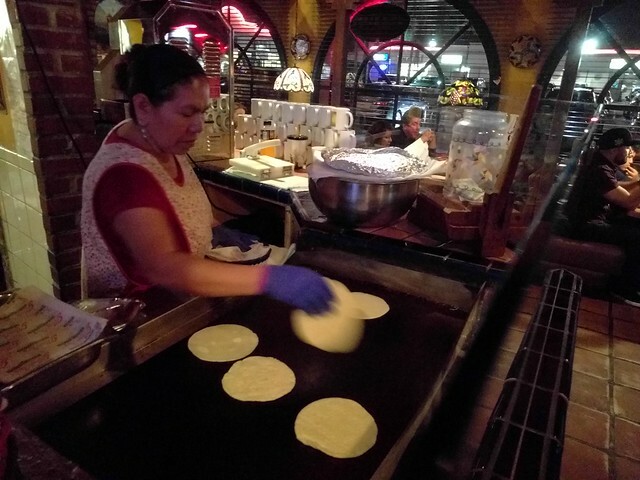 They make their own corn tortillas on premises and serenade you to mariachi music. 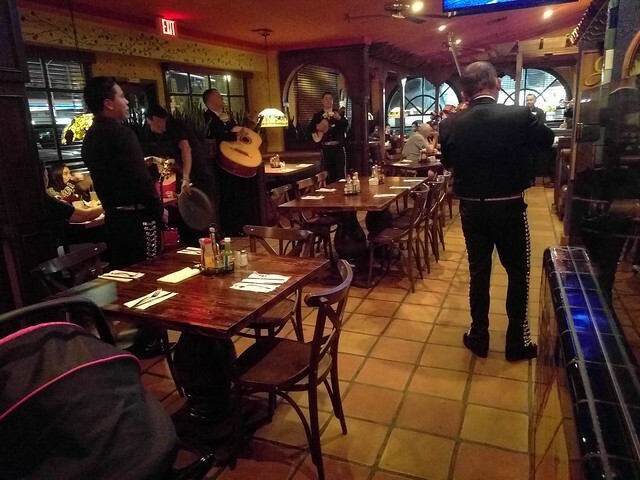 Go and enjoy a great dinner and tell them Downey Daily Photos sent you. I visited a new business, named Academy, in downtown Downey tonight. I have often passed by here during our walks in downtown and have been curious about what was going on. Academy is a place to learn and perfect your technique in jiu-jitsu fighting. Jiu-jitsu originated in Brazil. The goal in this type of fighting is to bring your opponent to submission, either by cutting off their air supply, cutting off their brain's blood supply, or dislocating or breaking an arm. During this visit, I watched several 6-minute sessions. I was impressed at the stamina and concentration it took to bring your opponent to submission. To learn more about Academy, go to their website here. They also have classes for children. This is one position of putting your opponent in submission. You see the fist on the neck and the upper body applying additional pressure onto the fist. 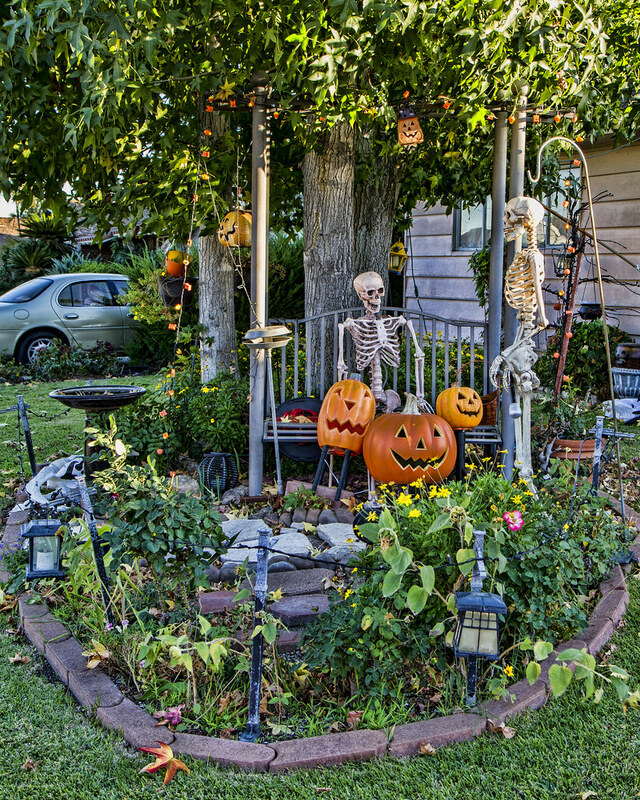 Another example of some really creative yard art for Halloween. A little creepy for small kids, but pretty fun! It's Monday night, and the library is quiet. On the adult side, most of the rows are empty. The kid's area is busier, but still quiet, with groups of kids and their parents, working on projects. 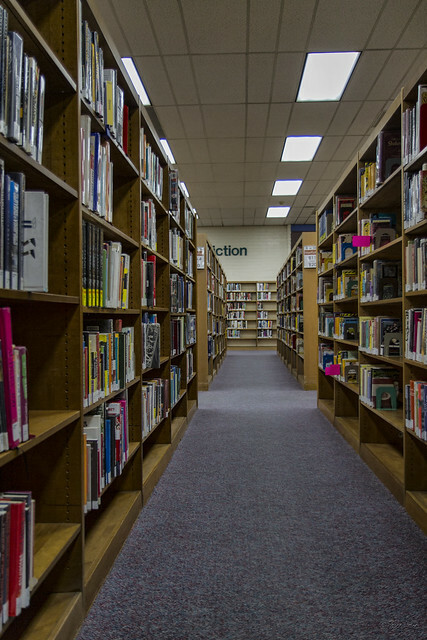 "A library is like the best person you know - politely quiet but endlessly informative, amazingly knowledgeable but charmingly discreet, open to everyone yet subject to your every whim, and, sadly, flammable if one isn't careful. Be careful with yours." 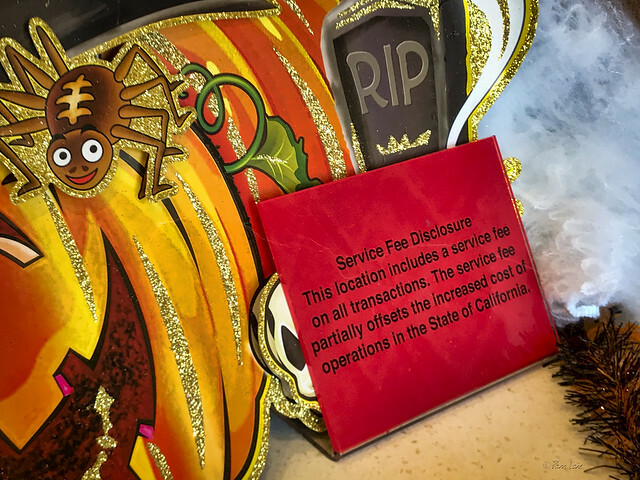 Hiding a service fee notice in the spooky decor doesn't make me feel any better about it. Unlike a tip, which goes only to the people who wait on you, a service fee can be used to compensate all employees, including the cooks and dishwashers who don't typically get to share in the tips. The reports I read seem to agree that restaurant staff people are supportive of this practice. Service fees are common in Europe and replace the tip. This particular notice isn't clear on whether it will be given to the employees are not. Leaving me with the question—to tip or not to tip. 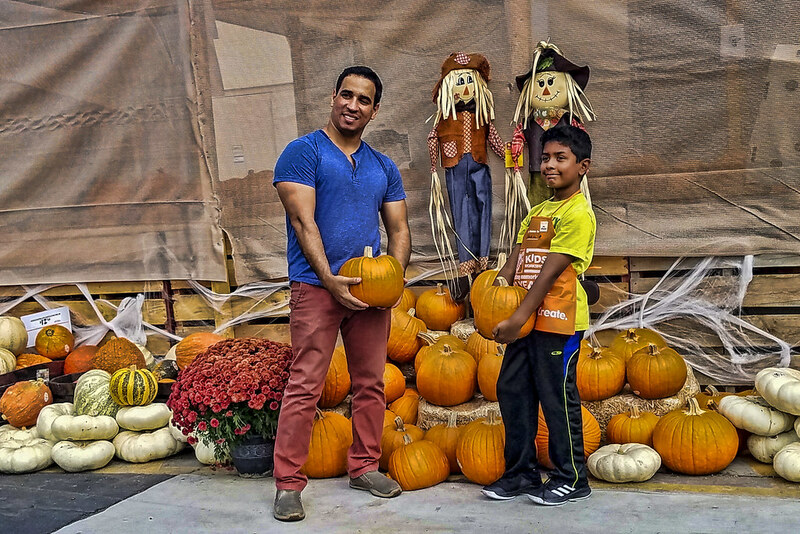 "I come from a lower income Mexican family and I can remember times when we struggled to make ends meet. One Thanksgiving was tough for us because we didn't know if we were going to have dinner. The most important part of that day that I remember though is that the family was together and we were happy together. I was old enough to learn that the most important thing was to be around people you care about and who support you. 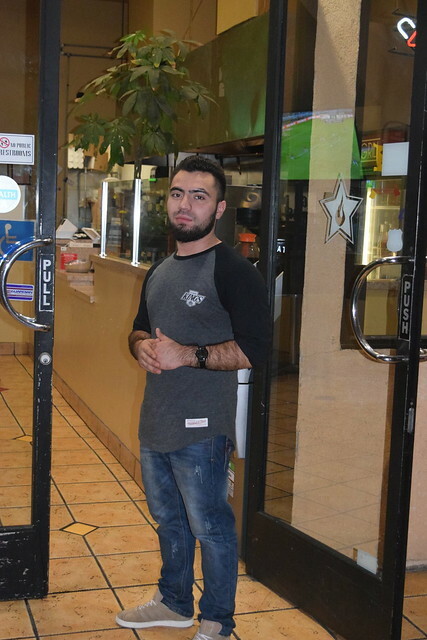 "Thinking about that part of my past and comparing it with today, I realize that my job here at The Mambo Grill is like that. I used to be a manager at a structural steel company. Then I took a part time job here on the weekends to supplement my income. But I found that I had made some good friends here. People that I could relate to, people who are going to be there to support me. That's why I left the other job to go full time here. Family is very important to me." 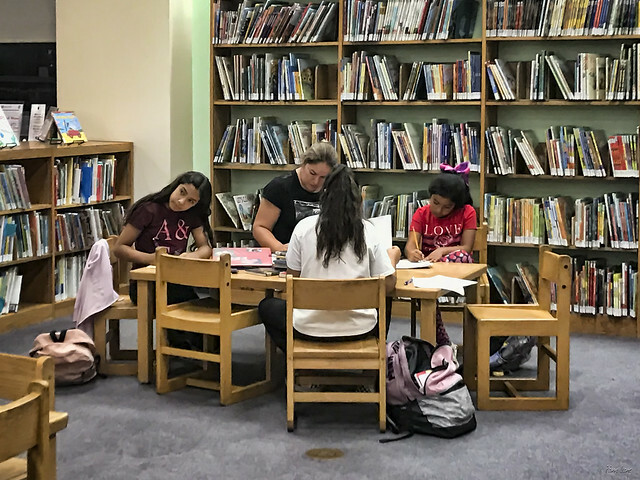 The Assistance League's Second Tyme Around Shop on Downey Avenue is open year round and is there to assist you in helping others. By purchasing second-hand merchandise you help them in helping the less fortunate in our community. 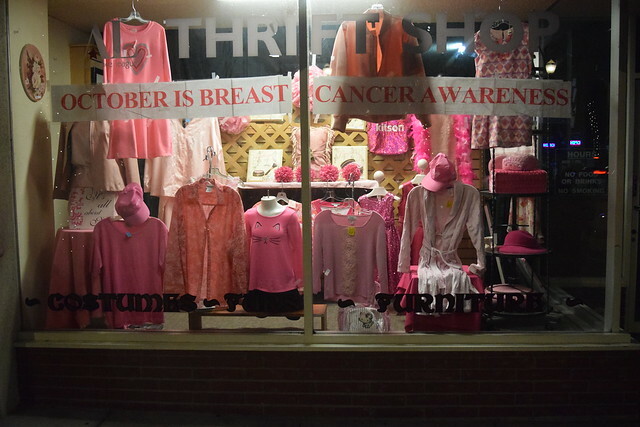 This month you can also support breast cancer research by buying something pink. Try it. See their website here. 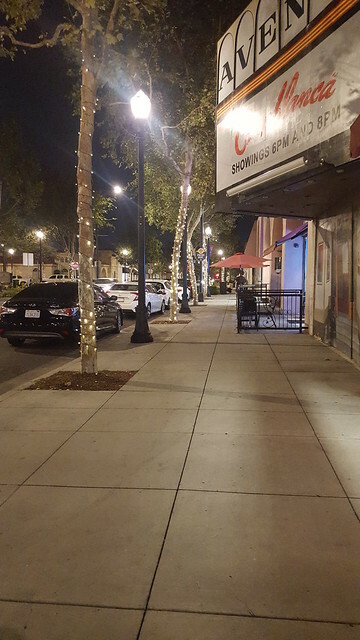 At the same time, you can take a stroll up Downey Avenue in the evening lights. PS Downey Avenue picture donated by my wife, Bonnie. 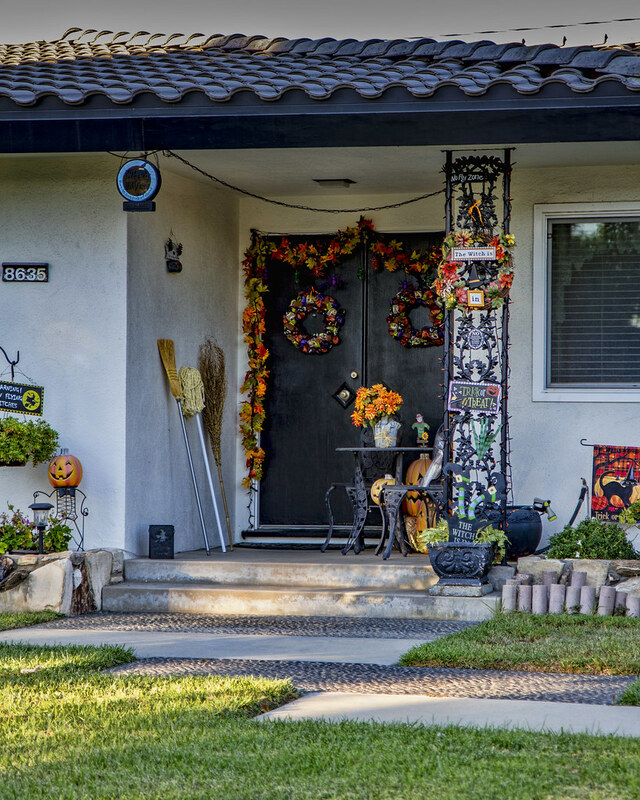 It is October and the time when more and more houses are adding pumpkins and Halloweeny decorations on front porches and on lawns. 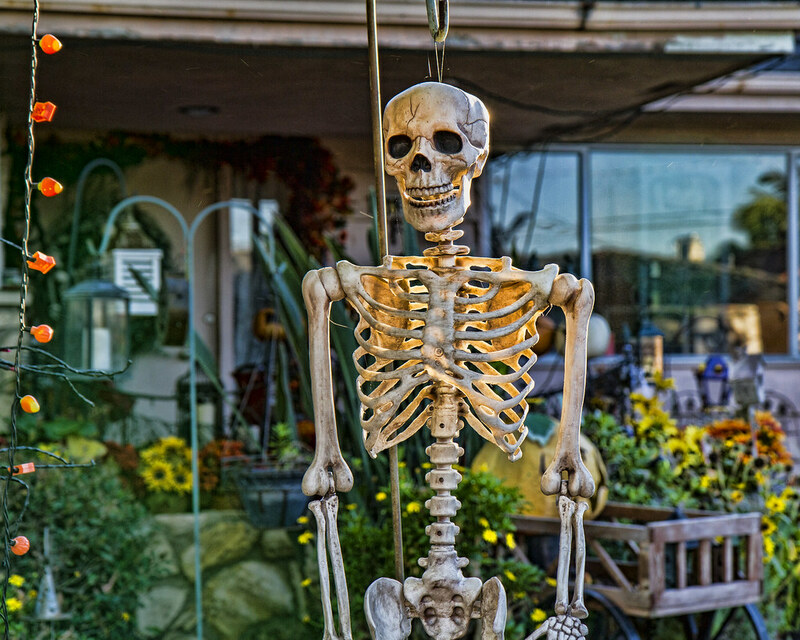 It's not just individuals who are decorating for Halloween. It seems that every business I enter these days, such as this Pizza Hut, is already getting into the scary Halloween spirit. 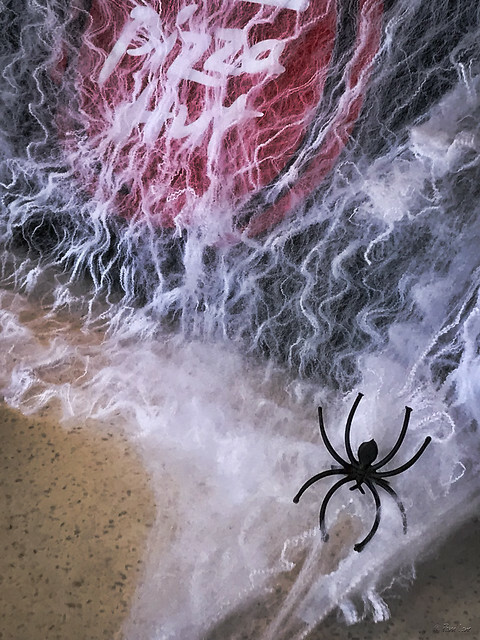 "The only thing we have to fear is fear itself...and spiders." It's that time again. 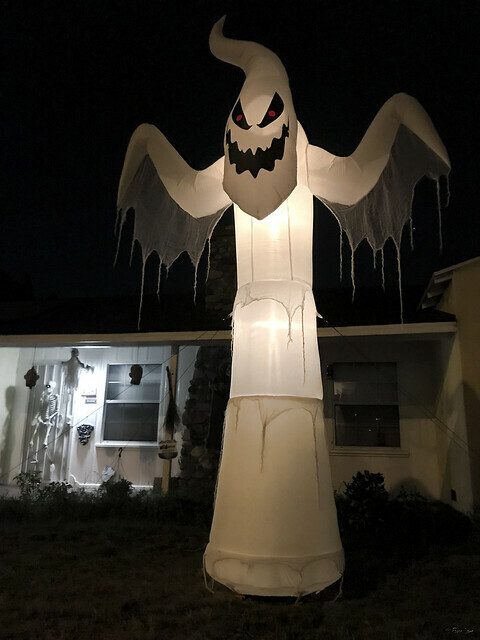 Ghouls and ghosties are popping up around town. 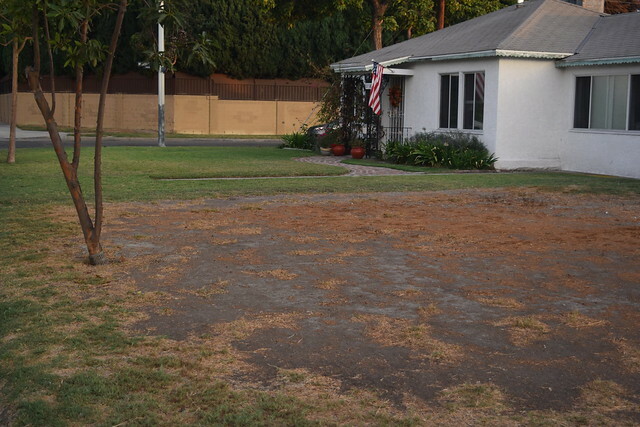 Downey, along with much of California, has been in a drought situation since 2011. If you would like to see an article about California's past droughts in pictures, click here. The drought has caused the state government to create new laws to encourage more prudent water usage. 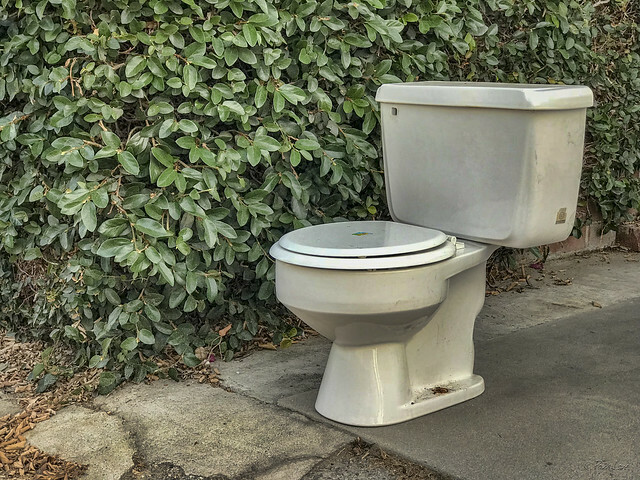 One of the proposed laws would have made it illegal to water your yard during the drought. Even though the law didn't pass, some homeowners have decided to follow the proposal. I went out to get a picture of the predicted rain we were going to have today, but it never showed up. So, I decided to take a picture of a lawn that looks like what lawns looked like before we started watering them. I'm hoping the winter rain will bring this lawn back to life. 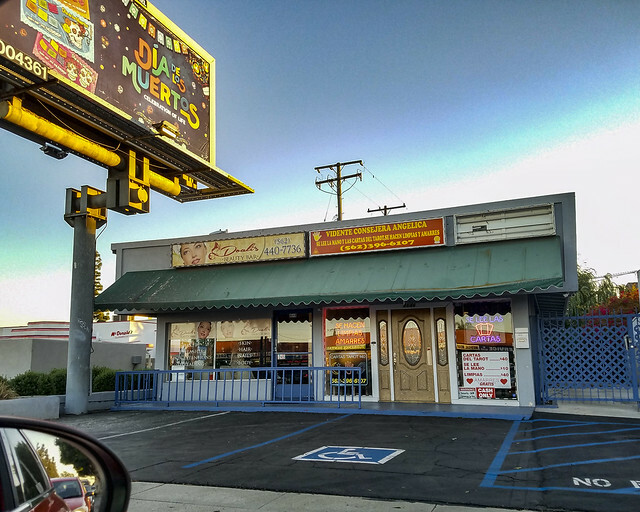 By the way, one of the great reasons I love living in Downey is how we care for our neighbors. While I was taking this picture, James, a neighbor, came out of his house to inquire about what I was doing. I explained to him about Downey Daily Photos and asked him to look us up on Facebook. Thanks, James. 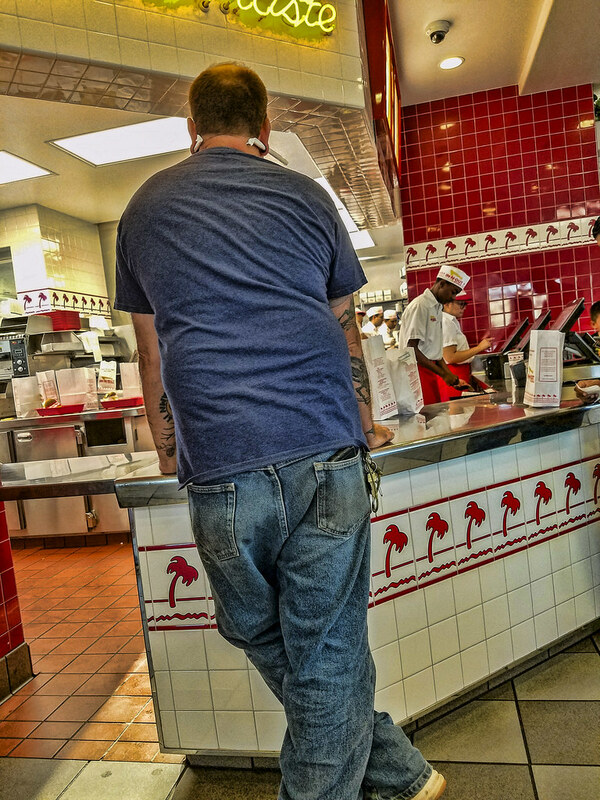 I couldn't resist snapping this picture while I waited to pick up dinner at In-N-Out Burger. Check out the straws pushed through his ears. Americans use 500 million straws daily. It is believed that it takes a straw up to 500 years to decompose. Plastic straw bans are going into effect around the US. California just became the first state to nix plastic straws from restaurant tables. Starting in 2019, customers in that state will have to ask for a straw if they want one. 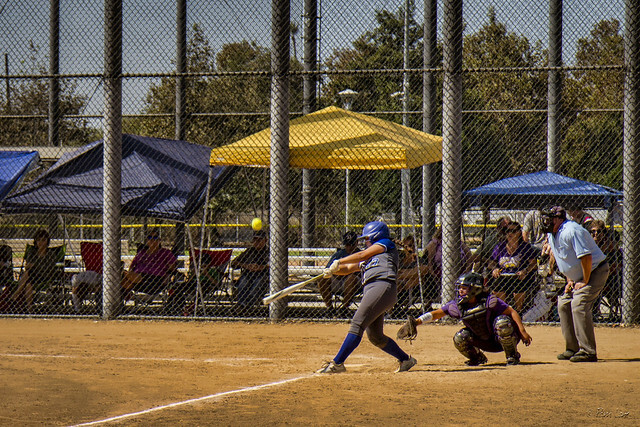 The Downey Nemesis fastpitch team was playing the Huntington Beach Diamond Girls yesterday at the Discovery Sports Complex. 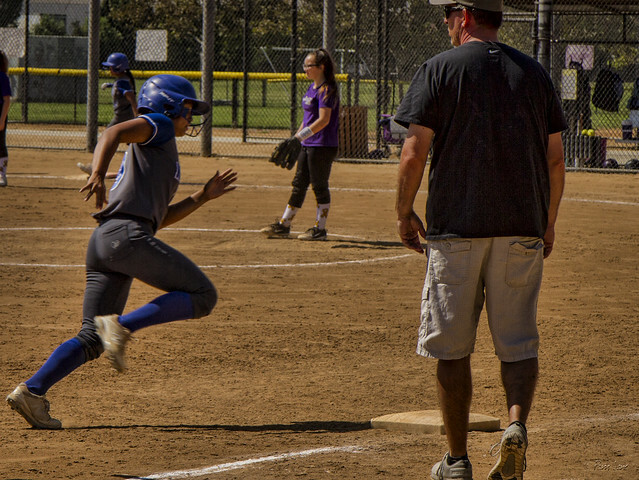 This player passed third base and scored a run for her team.